The Karnataka Under-17 Boys team bagged Bronze at the 56th National School Games Chess Championship-2010 held at Pt.J.Nehru Stadium, Fatordo,Margao(Goa) which was held from 11th to 14th November, 2010. The event was organised by Directorate of Sports & Youth Affairs and School Games Federation of India. 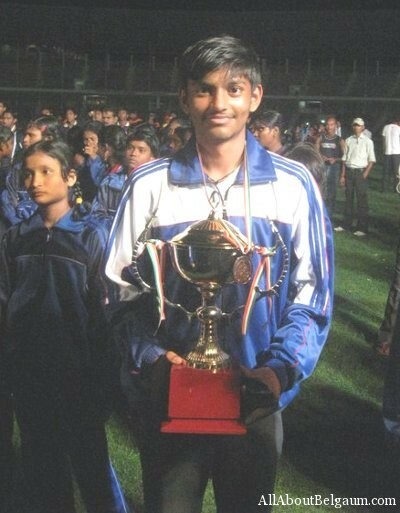 Belgaum lad Niranjan Navalgund of M.V.Herwadkar English Medium School led the team consisting 4 other players viz- Viani D cunha of Mangalore, Shrishan & Rakshit Umesh of Shimoga and HS Karthik of Bangalore and bagged BRONZE MEDAL. Earlier, Niranjan Navalgund had clinched the State Championship and first time Belgaum District was awarded TEAM Championship in Chess in the State Interschool Championship held at Bangalore during last month. Master. Niranjan also participated in the Under-17 National Chess Championship-2010 held at Jammu from 2nd Nov, 2010 organised by All India Chess Federation & Jammu & Kashmir Chess Association and was placed 11th scoring 7 pnts out of 11 rounds. Management and school staff of MV Herwadkar school, Belgaum have congratulated Niranjan for his excellent performance.